Nothing is confirmed by Sauerland Event but media in German writes that WBA interim superwelter champ “Golden” Jack Culcay (pictured) will defend the title September 26 at the Max Schmeling Hall in Berlin against an opponent to be announced. In the chief support there might be an interesting fight at supermiddle between Tyron Zeuge (17-0) and Eduard Gutknecht (28-3-1) where the winner is likely to get a shot at WBO ruler Arthur Abraham. Gutknecht was formerly with Sauerland but is now promoted by Wiking Box Team. He is set to fight Geard Ajetovic September 19 in Gifhorn but if this fight go ahead with the Zeuge fight coming later is apparently still a questionmark. As for Abraham he is nursing some injuries from the Stieglitz but the Sauerland PR machine have the word out that Abraham vs Bernard Hopkins is being discussed. 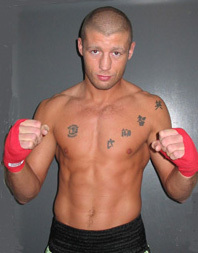 Retired Danish cruiserweight Anders Hugger Nielsen, 34, was found dead Sunday afternoon in the gym of the local boxing club in Odense, writes Ekstrabladet. The reason for his death is unknown and there are no comments from the police. Hugger (pictured) was many years a top class amateur and turned pro in 2006 and went 11-0 before he was forced to retire due to a serious eye injury and later became a coach and trained among others his wife Rie, who became national champ in 2014. Johann Duhaupas (32-2) and Zsolt Bogdan (10-0) clash for the vacant EU heavyweight title October 15 in Barcelona (Spain). The fight is co-promoted by Medhi Ameur and Maravilla Boxe. Duhaupas lost to current EBU champ Erkan Teper earlier this year but bounced back with an upset win over Manuel Charr in Russia. Bogdan holds the Hungarian title but is relatively untested.